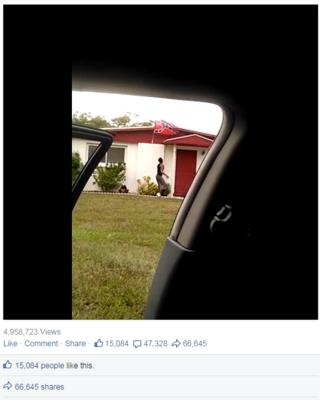 Image caption Florida police are looking for a man in connection with the theft of a flag - but has the viral video he appears in kicked off a larger trend? It's been widely reported that the "No Flagging Challenge" - in which Confederate flags are stolen - is spreading across the US. But in fact only a handful of videos showing such incidents have been posted online. Criminal? Very likely. Foolish? Yes, indeed. Political? Most definitely. The latest "challenge" to supposedly go viral involves stealing the controversial Confederate battle flag off of homes or vehicles, videotaping the act and posting it online. It's been dubbed the "No Flagging Challenge" and social media and international news outlets were quick to pick up on the story. Videos posted online seem to show African-Americans stealing the flag. "Vigilantes play DARE with the confederate flag," one newspaper headline declared, while another called the stunt "quick, direct, illegal, and likely to provoke rage." Given the charged atmosphere, it's not surprising that there was widespread concern that the "No Flagging Challenge" was spreading. But in fact those fears seem misplaced - and the trend appears not to be spreading at all. So far, only one "No Flagging Challenge" video has gone hugely viral. It was posted to Facebook and has been watched 5 million times. The footage shows a young black man jumping out of a car, running up to a house where a Confederate flag is flying outside, ripping the flag down and running back to the car. Police in Manattee County in Florida say they're investigating the incident, and the man's identity is not known. But beyond that, there's not much going on with the challenge. In the past week various hashtags related to it have been mentioned around 4,000 times on Twitter - a significant number, but not huge by any measure. By comparison, the hashtag #GrowingUpBlack, which was driven by African-American Twitter users, was used more than 2 million times over roughly the same time period. And in fact, most of the Twitter messages about the flag challenge were warnings, shares of news articles and reactions against the idea of theft, rather than calls to action. More tellingly still, there are only a handful of actual challenge-related videos circulating online. In addition to the Facebook video mentioned above, BBC Trending found footage of a man tearing flags off of a car, and one of an altercation that seems to be between two white people waving a Confederate flag and a group of young black men, but the details surrounding the video are unclear. The potential for violence around such an emotive symbol is clear - several weeks prior to reports about the challenge, a brawl broke out at a South Carolina rally, reportedly prompted by accusations of flag stealing. But other viral challenges - for instance the Ice Bucket Challenge that raised money for charity last year - have been backed up with hundreds or even thousands of videos. So while there might be a lot of chat about the Confederate flag, it seems that the No Flagging Challenge is one that not many people are taking up.